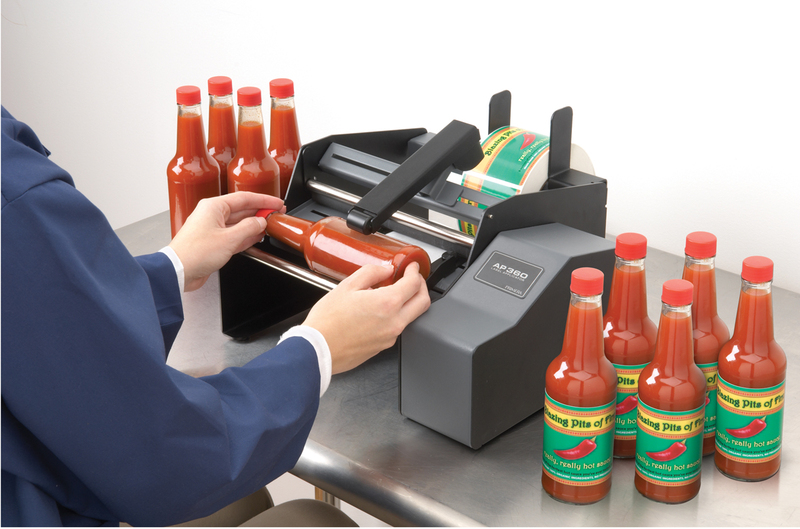 The Primera AP360 Label Applicator is the perfect solution for labeling cylindrical and tapered containers, such as cans, bottles, tubes, or even jars. This label applicator is compact and semi-automatic, making it easy to apply pressure sensitive labels exactly where you want them, straight and without any wrinkles or folds. The Primera AP360 is the ideal accessory and can apply any roll or fan-fed labels that have been printed through methods such as flexographic, offset, and thermal transfer. The Primera AP360 Label Applicator greatly increases productivity, by increasing the number of labels that can be applied per hour versus manually applying labels. Your finished products will have a highly professional look. The Primera AP360 Label Applicator has an integrated, spring-loaded pressure arm that applies uniform downward pressure in order to securely attach labels to the containers. Many different containers such as water, beer, wine, and other spirits as well as other beverages; vitamins and nutriceuticals; spices, sauces, and other specialty foods; paint and chemicals; and cosmetics, bath and spa products and other health and beauty care such as: oils, lotions, fragrances, and even the smallest of containers, such as lip balms. The labels are applied to the front of the containers. Operating the Primera AP360 Label Applicator is easy. Simply set the guides, place your container in the machine, press the footswitch and your label is applied. You will be able to apply your labels quickly and accurately, up to 1200 labels per hour, which is a significant increase over manual application of labels. The labels will be accurately applied without any wrinkles, which will give your products a professional look. Features include: quick and easy set-up and operation, quick and accurate application of labels, compact size (will fit on most desks and countertops), professional design (one of the only label applicators that are available with UL, CSA, and FCC safety and emissions certifications, and it is built with sheet metal that is heavy duty and is therefore industrial strength. Optimedia Labs is your source for label applicators. Talk to our specialist to find out which label applicator is best for your business. Primera AP360 is the base model. It quickly and efficiently applies single labels at a time. Also available is the Primera AP362 is an advanced model. It can apply one or two different labels to a single container. A built-in LED counter and memory for up to nine front-to-back label offsets is also included.